Cadillac is preparing to launch a new flagship sedan based on the XTS Platinum concept that will replace both the STS and DTS sedans in the luxury automaker's lineup. Our trusty spy photographers recently caught this camouflaged prototype within GM's testing facility, showing that the car has skipped the normal test mule phase and gone right to what's called the IVER - Integration Vehicle Engineering Release - stage. During its move from concept to production, the XTS has lots its frameless window design in favor of more traditional pillars, including a proper B-pillar construction. Still, the shape and placement of the door cut lines seem to be identical to the concept, as does the rake of the C-pillar. Since the production XTS will ride on the same Epsilon II architecture that underpins the Buick LaCrosse, expect the production car to be front-wheel drive, though it's likely that an all-wheel-drive variant will be offered once the car hits showrooms. See the prototype for yourself in our high-res gallery below. 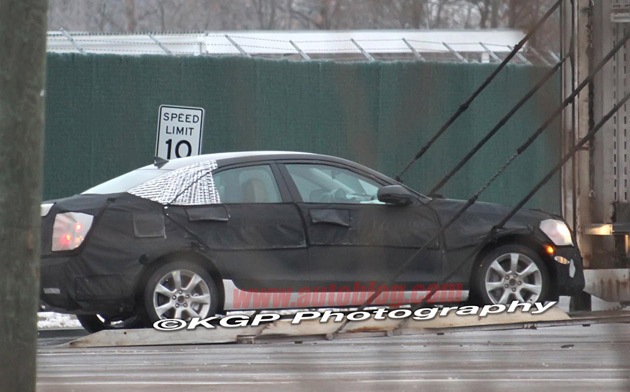 [source: KGP Photography]Spy Shots: Production Cadillac XTS caught testing originally appeared on Autoblog on Wed, 26 Jan 2011 11:29:00 EST. Please see our terms for use of feeds.